A few weeks ago my sister posted this on Facebook, "making some delicious Poblano chile fries, nachos, and guacamole :) MMMmmm!" What? 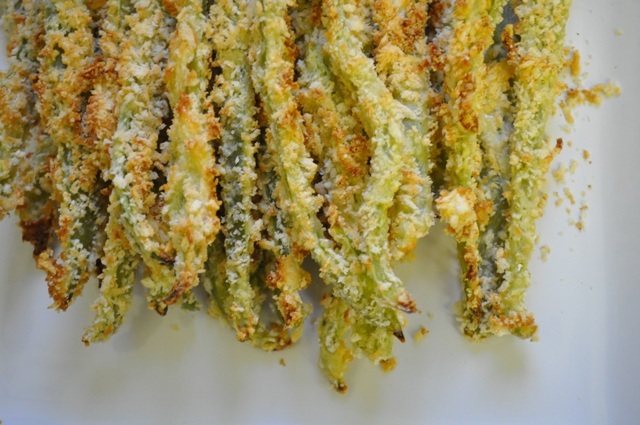 What are poblano chile fries? I need details. Luckily my sister came for a visit for a few days and made us these tasty fries. Like traditional potato fries, these are addicting. Chile fries are deliciousness. That's what they are. Do you like jalapeno poppers? 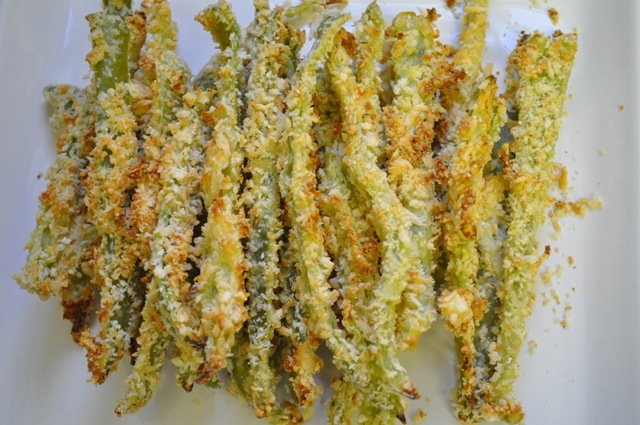 Chile fries are jalapeno popper-esque in flavor with thin strips of green chile coated in flour, egg panko breadcrumbs and parmesan cheese. They have a cheesy, crunchy exterior and a tender mild green chile interior. Dip one in a little lime adobo sour cream concoction...even more delicious! These fries are easy to make. So easy that I made them the day after Katie left. I couldn't resist. No official measurements are required. You can use any type of chile that suits your taste. Green chiles (also known as Anaheim chiles) are very mild in flavor, poblano (also known as pasilla) chiles have a little more spicy going on or go for the jalapenos for an even spicier kick. Preheat oven to 400 degrees. Line a baking sheet with tin foil and spray with non stick cooking spray. You will need 3 bowls or dishes large enough to fit the chile's length. Fill one bowl with enough flour to coat your chiles. Fill the second bowl with the beaten eggs. Fill the third bowl with enough panko bread crumbs to coat your chiles. Add parmesan cheese to the panko in a ratio of about 4 parts panko and 3 parts cheese. Season the breadcrumb/parmesan coating with garlic salt to taste. Quantity of chiles depends on the type you choose. For our green chiles Katie allotted one large anaheim chile per person. I would say 2 jalapeno per person or 1 poblano chile for every 2 people. Cut chile in half lengthwise and remove ribbing and seeds with a knife. Cut halves into 1/4 inch strips, lengthwise. 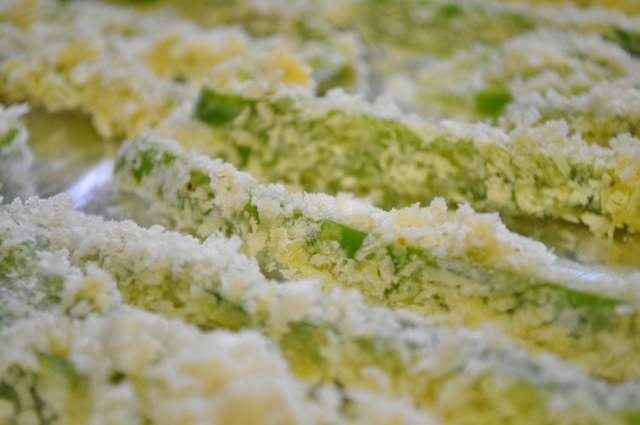 Dredge the chile strips in flour, then egg, then the breadcrumb mixture and place on the baking sheet. Arrange coated chiles at least 1/4 inch apart. Bake chile fries for 18 - 20 minutes, or until golden and crisp on the outside and you can easily pierce the chile with a fork. Serve immediately. For Lime Adobo Cream: Combine 1/2 cup sour cream, 2 teaspoons of finely chopped chiles in adobo sauce and the juice of 1/2 lime. Holy toledo...these look fabulous and completely addicting! !